toward Jews. AP/Wide World Photo. life span of about one month. West Bank and Gaza Strip. down an overall 15 percent. served as Rabbi for 21 years. funds they are able to give. government not to allow this." lished him as a major scholar. the time the lists closed. from participating in the race. left of the political spectrum. the late holy man, Baba Salli. letic meeting of the season. allegiance, but to the Rev. 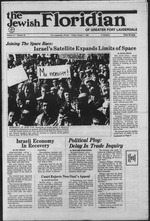 tion as the "most pro-Israel"
Bentsen" ticket as a "troika,"
been announced by President Ronald Reagan. das and biases of their own. have not teen as positive. ness" cited included the U.S.
Palestinians in the West Bank. The lightest of the lights. life unmatched by any other in the free world. works to enlighten and protect Jewish life. our own environs and beyond. as world Jewry celebrates Simchat Torah. on multiple meanings especially in Russia. we expect the same to be reported next week. of mass murders of Ukrainian Jews in 1941.
sian history is allowed to issue forth. brethren in the Soviet Union. WSt N0THW6 DOWH NO TAPE RECORDERS. and empathy the late Dr.
Jewish people posited in him. demand admission to the UN! invited him to address them. What will it mean for Israel? "foul" and shed tears of oil. that it is most "inopportune"
incoming one to do so. Maafear JTA. S. ArU. WN8. NBA. AJPA. aatf PPA. Jawtak FfarMtaa Dm Nrt Guruu. Kukratk of MarckaMUM AaWartiaarf. and hatred in this region." Israel within the 1947 borders! but did not share with Israel. here among so many others. guage, but I am eager to learn. best promotes understanding of world Jewry. longtime editor of the Jewish Telegraphic Agency. 711 Third Ave., New York City 10017.
our prices to the Fabulous Fifties! are not quite there yet,"
the Reagan Administration from Iran. ^ ^ ^ ^ ^ ^^ ^^ *wmt. Smith said in his letter. the plight of Iranian Jews. "The Jews of Iran are at risk. Egg Custard Pie... L *1"
Ai- ^c?oCVX2oTiJurs- October 6 thru Wed..
n Dade Broward Palm Beach, Martin. St. Lucle. Indian River and Okeechobee Counties. the board of Food Fair Stores. of the firm's original founder. ering services are also offered. Sunday to Thursday, 8:30 a.m.
make it easier and less expensive to telephone Israel. Dade, Broward and Palm Beach. Anwar Sadat was the first. pay for the cost of their care. WQAM, 560 on the AM dial. Broward's first KOSHER retirement center. Physicians on call 24 hrs. water the way it should taste. Hot Springs, Arkansas. Taste it. Shabbos dinner and Maxwell House* Coffee. 20 to 25 prominent Jews. and the Jewish Welfare Board. Vance on the Middle East. tee s ethnic outreach groups. the RNC on the state level. bers cited in the report. after World War II, "the U.S.
former Nazis to serve in U.S.
E lection of the President. the victims of Hurricane Gilbert in Jamaica. compiled a list of supplies requested by rescue teams. charge to the Caribbean nation. Continental's Golden Traveler Passport. And 10% Senior Citizen Discounts. No other airline offers more ways to save to more of the world. Or the South Pacific. Or any combination. Your choice. you're 65 years or older on any published retail fare. Even MaxSavers. Get all the details by sending in the coupon below. Or call your travel agent or Continental at 1 -800-525-0280 a free brochure. YES. I love to travel. And I love to save money. Passport and 10% senior discount. and Henry Kell of Sunrise. Nov. 6, 10:30 a.m. 2:30 p.m.
reviewed by Dr. Abraham J.
will not be sold at the door. fine of up to $10,000 per day. the new year on Tuesday, Oct.
Yamato Road in Boca Raton. us to kindle the Sabbath light. Barbara, of Ft. Lauderdale, died Sept.
Are You Considering Making A Pre-Arranged Funeral? Broward, Dade and Palm Beach counties"
Blasberg Parkside Funeral Chapels, Inc.
up the question of accomplices. it was an independent nation. fire. There were no Israeli casualties. the Israeli border of the Galilee panhandle. in the neighborhood of 20,000.
percent in the 1981 census. the Central Bureau of Statistics announced here. year, of whom 73,000 were Jews. 1,000 more than the previous year. The 3-2 decision by the U.S.
faction from 1977 to 1981.
civil rights were not violated.